Flyweight champion Henry Cejudo is headlining the card against Marlon Moraes for the vacant bantamweight title. Yesterday, surging 135-pound prospect Petr Yan was booked against Jimmie Rivera. And now, another exciting scrap has been confirmed as Pedro Munhoz is squaring off with Aljamain Sterling. ESPN was the first to report the booking. Pedro Munhoz (18-3) is coming off the biggest win of his career as he knocked out former champion Cody Garbrandt at UFC 235 last month. The 32-year-old has won seven of his last eight fights, with his lone setback coming against former title challenger John Dodson where he lost by split decision at UFC 222. The American Top Team product heads into this matchup off back-to-back stoppage victories. Munhoz boasts an 8-3 record in the octagon with wins over Rob Font, Bryan Caraway and the aforementioned former champion Garbrandt. 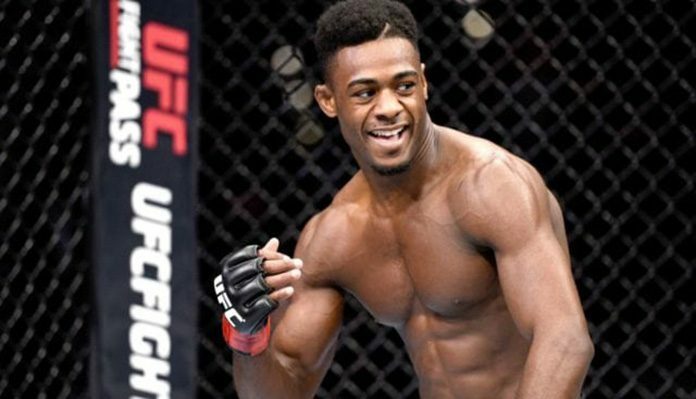 Aljamain Sterling (17-3) has really turned things around since his knockout loss to Marlon Moraes. The 29-year-old has won three-straight fights, including a decision win over Jimmie Rivera at UFC Brooklyn back in February. The New York native also handed Brett Johns his first career loss and became the first fighter to finish Cody Stamann when he did so at UFC 228. Sterling has amassed a 9-3 record in the octagon, including victories over former bantamweight kingpin Renan Barao. an updated look at the card.